Northern Ireland hauliers who service the island of Ireland fear they will be among the first to suffer if a hard Brexit takes place. They also claim that in its Brexit planning, Britain's Department of Transport has made no provision for a UK-EU land border on the island of Ireland. Patrick Derry owns a freight transport business based in Co Armagh. He employs 150 people and Derry Transport Limited has an annual turnover of £12m. His clients include Tesco, Lidl, Dunnes, SuperValu, Asda and Sainsbury's. Around the clock his refrigerated trucks are collecting and delivering goods across the island of Ireland, Britain and mainland Europe. Patrick and Northern Ireland-based hauliers like him say they have a major problem. After Brexit vehicles crossing borders will require a permit, issued by the UK’s Department of Transport. According to Seamus Leheny, policy manager of the Northern Ireland branch of the Freight Transport Association, there is chaos looming. 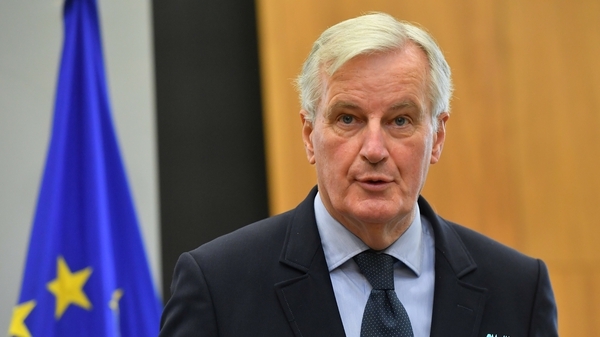 He claims that when the Department of Transport in London was devising its post-Brexit permits system, it classed journeys to the Republic of Ireland from Northern Ireland as "not journeys to the European Union". His assessment is that under the Department of Transport template, which does not class a trip into the Republic of Ireland as an EU journey, Northern Ireland hauliers can expect a total of 60 permits, each one linked to an individual vehicle, for a 12-month period. "We have 13,000 lorries currently crossing the Irish border in both directions daily. 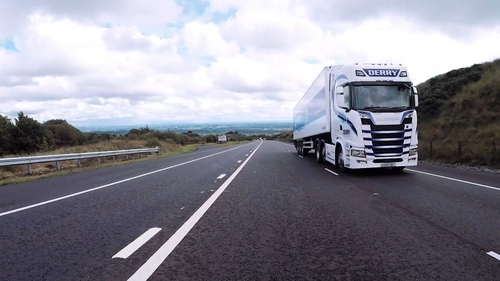 On one road, between Derry and Donegal, we have 800 trucks a day and that’s only on one minor road. "So simply if we are saying we need to rely on these permits, and we are only going to get 60, we would say there is no point in even printing the permits because they won’t be worth the paper they are written on." From his Armagh base, Patrick Derry is dispatching 70 trucks around the island of Ireland each day. His company alone would require the entire quota of Northern Ireland permits. "You’d have a lot of customers asking you what’s your plans for Brexit, what’s your contingency plans and what’s going to happen and could happen." "We have no advice - the politicians themselves don’t know so it is very difficult for us to give advice or tell what we are going to do until we know what happens." Patrick explains the role of the permits this way: "You need basically to leave GB to enter Europe. You’ll need them to go from Newry into Dundalk - you are leaving GB to go into Europe and that’s what you will need the permit for. Otherwise you are illegal." He is worried about the situation. "Hopefully they will be able to get a deal done for the island of Ireland in its day-to-day business. "You would have thought that for the island of Ireland with its good, its bad and its woes, that the British government and what's left of Stormont would have had the idea that Northern Ireland, being of special status where we are right in the island with a European border, would have something in place at this stage." Seamus Leheny and hauliers like Patrick Derry brought their concerns to the very heart of the British government. When Theresa May was meeting Northern Ireland business representatives and sought to build up support for her Withdrawal Bill, Seamus and Patrick were part of the delegation that travelled to meet her. They have photographs taken outside and inside 10 Downing Street. They also met Mrs May when she came to Northern Ireland and they had discussions with David Davis when he was the Brexit Secretary. But to date, they say their very issue has not been addressed. A few miles from the site he currently rents, Patrick Derry is overseeing the construction of a major new headquarters. "We have built the company over 20 years and the new premises is designed to allow us to operate and expand for decades to come." But the Brexit stalemate has Patrick and Northern Ireland hauliers like him wondering what the future will bring. He left school early because he had an ambition to develop a transport business. His wife, Fiona, is a solicitor from Leixlip, Co Kildare. They have three children and are building a new home in Co Armagh. Like many border families, they have developed an almost obsessive interest in the politics of Westminster.